The Martin Guitar Company has been one of the most popular manufacturers of acoustic guitars for over 150 years. Setting up one of these instruments requires checking and adjusting the neck, nut and saddles. Check the curve of the neck. Hold the guitar in a comfortable position and press down the low E string at the 14th fret using your right hand. Still holding the string down, press on the first fret of the same string using your left hand. Examine the 5th, 6th and 7th frets. 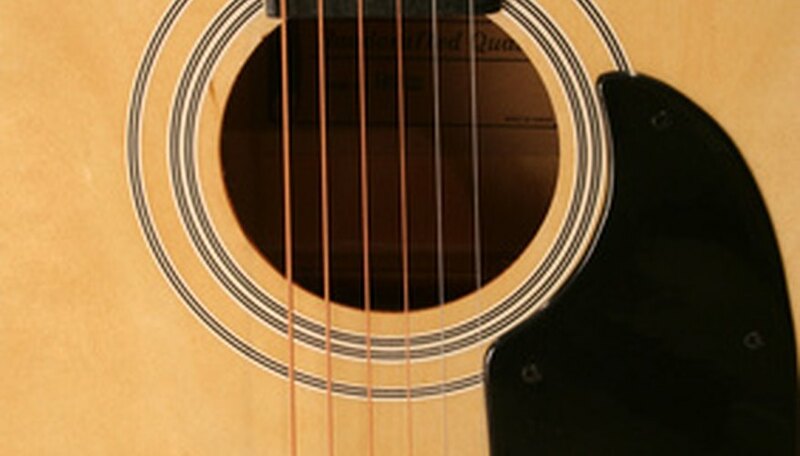 If the neck has the correct amount of curve, there should be a tiny, almost invisible gap between the string and the metal fret at this area of the neck. If the distance is too great and can be measured as more than 1/64 inch, the neck truss rod needs to adjusted. Adjust the neck relief or curve by adjusting the truss rod, which is accessible at the headstock end of the guitar. If there is too much forward bow and the strings are sitting too high above the 5th, 6th and 7th frets--or if they rattle when played--use an allen wrench to tighten the truss rod to force the neck back. Turn the wrench one half turn clockwise and examine the neck angle. If there is no distance between the strings and the 5th, 6th and 7th frets, use an allen wrench to loosen the truss rod--it will reduce resistance to the neck, which will allow the strings pull forward more. Turn the wrench one half turn anti-clockwise and examine the neck angle. Examine and adjust the nut of the guitar. If a string is too high at the nut, it can sound out of tune when played. To check string height, press a string down between the second and third frets using your right hand and examine the same strings height at the first fret of the neck. If the string sits noticeably above the fret, the nut slot may need to be worn down which can be achieved by using fine grade sandpaper. If the string is too low and there is some buzzing at the nut when the guitar is played, a small thin piece of paper can be inserted into the nut slot for the corresponding string which will raise it enough to remove the buzzing sound. Set the height of the bridge. Use fine-grade sandpaper to sand each saddle piece to allow the strings to sit evenly. Remove the strings and gently rub the sandpaper over the saddles evenly to reduce their height. It's often desirable to set the action in a curve shape that begins with the low E saddle, rises above the D and G string saddles and falls flatter over the B and high E strings. You can achieve this by sanding down the low E, A, B and high E string saddles but not sanding the D or G saddles. String action is subjective so sand the saddles down gradually until the guitar feels comfortable to play. Martin acoustic guitars made after 1985 have an adjustable neck tension rod located at either the headstock or body end of the guitar. If you own a Martin guitar manufactured before 1985 and want the neck adjusted, consult a professional technician. String action is subjective, so experiment to find the action that works for your playing style. Turn the truss rod only half a turn each time you adjust it. Wait for the guitar to settle and examine the neck angle.